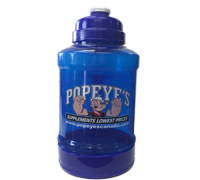 The World’s largest most progressive hydration bottle, carry your full days water supply with you at all times. New & Improved, EXTRA DURABLE! Carry your full day's hydration in 1 handy travel bottle. 2.2L water jug with measurement indicators on the side. 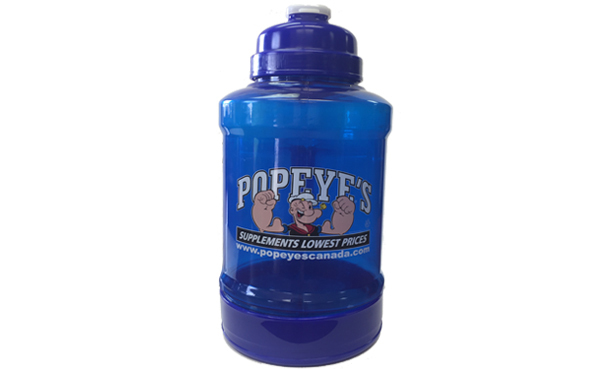 Same great custom Popeye's molded lid as your Typhoon shaker bottles - with Popeye'sCanada.com text around cap and new tighter fitting locking flip-cap with Popeye's logo. NOW FEATURES a screw-off bottom container with 'Y' compartment divider. 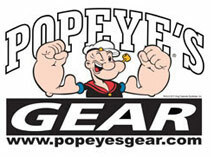 Features large full colour Popeye's wrap design and Enlarged easy carry handle with grips.